Rainbow cookies, my all time favorite cookie, were one of the first things I tried to make in the days prior to owning an artisan mixer. It was a complete and total disaster. Since acquiring the mixer, however, I have had considerable success with this recipe. The recipe I used, from Gothamist, can be found here. 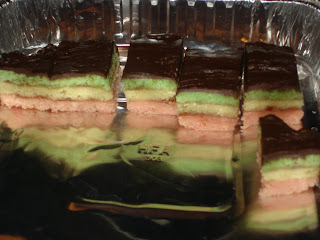 If you are not familiar with these cookies, perhaps you remember them as tri-colored cookies (always green, yellow and pink) flavored with marzipan. They are actually not made with marzipan at all, but with almond paste which is similar. To execute this recipe, I made a couple variations which basically allowed me to do it all in one day, and actually within a few hours. First, I broke up the almond paste in my cusinart miniprep food processor. Then in the artisan mixer, I combined the butter, almond paste, egg yolks and vanilla according to the instructions in the recipe (see link above). The I mixed the flour and sugar in a separate bowl and slowly added to the mixer. Then I set this aside and whipped the egg whites to form stiff peaks, as discussed in my previous post about souffles. This is actually relatively easy to do and I did not have the difficulty mixing them in as the recipe suggested that I should. The next part, always done by my patient husband Brad, is to separate the mixture into third and dye one part green, one part red with food coloring. Leave the third part plain. The Brad uses a spatula to carefully spread into separate pans to make layers. 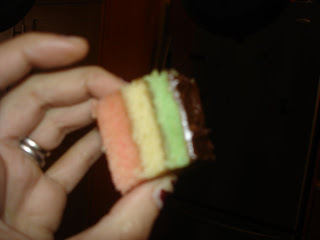 The layers were pretty thin, but not too thin, and even. Then we baked the layers at 350 F for 10-15 minutes until very VERY lightly browned. Then (and this is the hard part! ), Brad somehow flips the pans to get each layer out while I spread the jams lightly between the layers. I will press with a large book (in my case the Beatles Anthology) for about an hour, and this is usually sufficient. The next step is to make the tempered chocolate in a double boiler. I do not have a double boiler, so I just boil some water and put the chocolate in a small mixing bowl and it melts just fine. Once this is complete, I spread it over the top and sides of the cookies. The I refrigerate for about an hour and slice. I was so happy when I figured out this recipe, as I had finally figured out my absolute favorite dessert since I was a little girl. Very nicely explained and enjoyable to read.